The Last Supper is one of Leonardo da Vinci’s most popular works and the most famous of Last Supper’s representations ever created. Such a masterpiece dating back to the Renaissance is preserved at Santa Maria delle Grazie - a church and Dominican convent in Milan – and represents an important piece for all those who love Leonardo da Vinci’s Renaissance painting. Leonardo’s Last Supper shows the dramatic moment of Jesus Christ’s final meal with his twelve Apostles, as mentioned in the Gospel according to John (13:21). During the meal, Jesus predicts that one of his disciples will betray him. The twelve apostles are placed around him and we can see they’re noticeably upset by the Prophet’s words. It is just in the representation of emotions on the faces of the 13 personages that stands the magnificence of Leonardo’s masterpiece: he makes visible the “soul motions”, an essential element for an artist, as mentioned by the same Leonardo in his A Treatise on Painting. 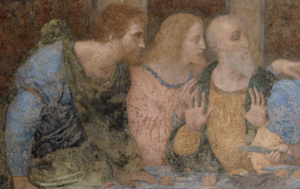 The Last Supper was oil-painted on plaster, with a particular technique: a panel painting on dry walls never used before for frescoes. Probably this is the distinctive feature that makes Leonardo’s works unique in the world: the experimentation of new techniques, which unfortunately were unsuitable for a good conservation with the passing of time. As a matter of fact, also The Last Supper had a series of serious problems for conservation and so it underwent several restorations, which gradually lessened the peculiar features of Leonardo’s painting. During 2nd World War, Santa Maria delle Grazie was seriously bombed but the painting remained intact and in 1977 it underwent its last great restoration that lasted over 20 years. The intervention of the world’s greatest experts was able not just to restore the work, but also, through careful studies, to totally recreate Leonardo da Vinci’s stroke, bringing to light again the uniqueness of The Last Supper. Nowadays, Leonardo’s masterpiece was made even more famous by the book written by Dan Brown The Da Vinci Code - and later by the movie – which fascinated millions people from all over the world, who today come to Milan to visit the famous painting and try to discover the mysteries the writer talked about. The Museum is open from Tuesday to Sunday from 8.15 a.m. to 7 p.m. (admission allowed until 6.45 p.m.). Close on Mondays, on 1st January, 1st May, 25th December. Booking is required and it’s also possible to book online. 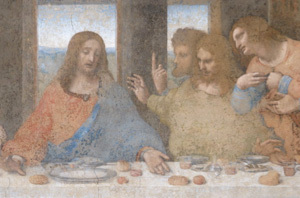 Click on the following link to follow our tips about visits and guided tours dedicated to the Last Supper of Leonardo da Vinci: visit the Last Supper and the Cenacolo. 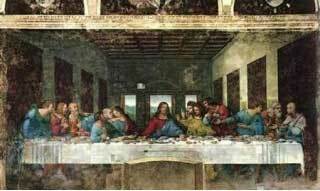 Discover the masterpiece of Leonardo da Vinci, The Last Supper. In the refectory of the 15th century Church of Santa Maria delle Grazie, is located Leonardo da Vinci's Last Supper, one of the greatest masterpieces in the history of art.